There were plenty of good stuff released this year and it seems I bought more stuff than ever before .. So here are my top 5 favourite collectibles released in 2012! 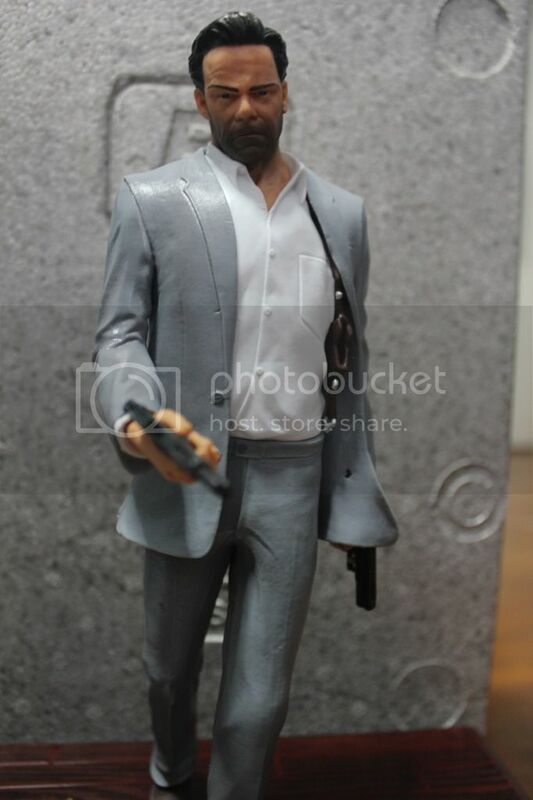 (Again, in no particular order..) Click the links for my blog posts of that collectible with more pics. A very cool statue of one of my favourite games of 2012. Forget the complaints about the lack of similarity between the in-game character model. His stylish pose and dual wielding guns are enough to make this one of my favourite. The bullet shells littered around him on the base also adds character to this statue. This was included in the Max Payne 3 Special Edition, which has remarkably dropped in price. So it's definitely worth the price if you grab one now..
With Rockstar releasing other promo items in their online store, I have purchased them to compliment this display above, with the statue being the highlight of course! 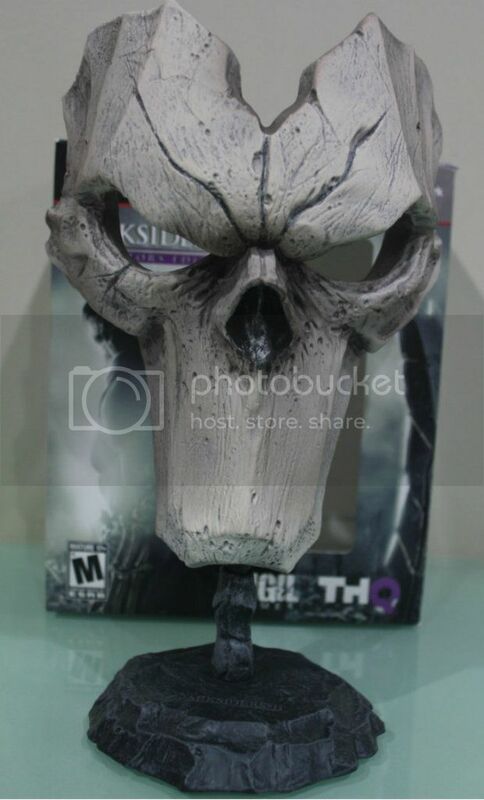 To be honest, I was actually a little disappointed when this was announced as part of the Darksiders 2 Collector's Edition instead of a Death figurine. It was more of a want for a set of Horseman figurines rather than not liking the mask itself. This is a brilliant, quality looking piece to add to my collection.. It was probably 1 of the most photographed collectible of the past year (at least from what I remember), with images of fans wearing the mask popping up all over the internet. 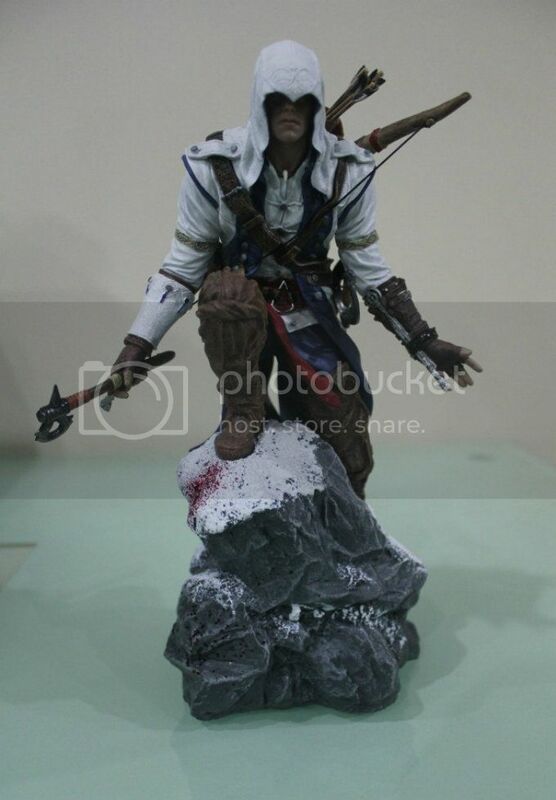 The 2 Connor Figures from Assassin's Creed 3. Been waiting for their release ever since they got announced. 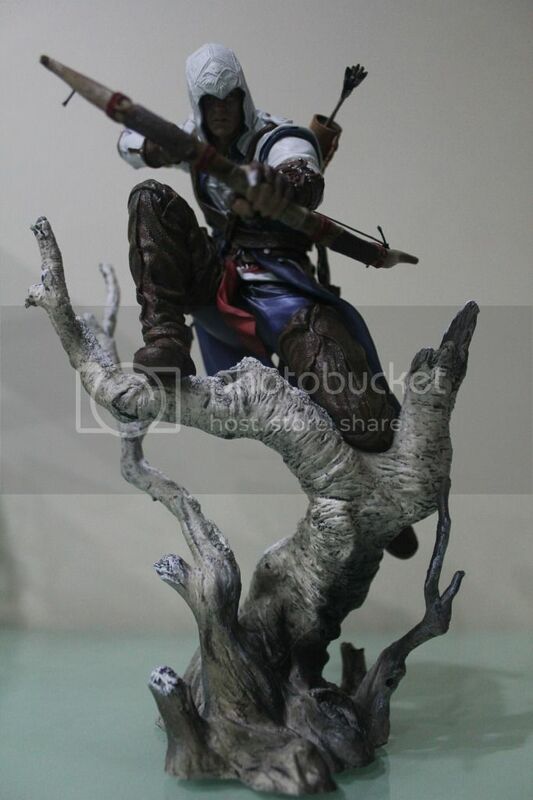 Great detail on both and a more dynamic pose as compared to the previous AC figurines. Really awesome and capturing Connor in action with 2 of his favoured weapons in the AC3 game. A very nice addition to the ever-growing collection of Assassin's Creed figures. I couldn't pick one over the other so both were added to the list. I can't believe I almost forgot about this one when I was preparing to write this post. Released early in the year and the fact that it's not on display but in it's box, this one almost slipped off my mind. How annoying that I don't even have pics of this.. This is my first and only Bust up to this point, a stunning 1/2 sized bust of my favourite Mortal Kombat fighter was a fantastic buy early this year. Comes with light up eyes and a high base, this is going to make me ogle at it for hours once I can find a place to display it. Words can't describe how fantastic this looks.. Will definitely try to get some pics up to show you how marvelous this is. There were dozens of collectibles released in connection with Assassin's Creed 3.. Pre-order bonuses, promo items, Collector's Edition goodies.. There were tons! You name, they have it.. From USB sticks to Steelbooks, Figurines to even Shoes, there aren't many games that come with this much marketing. However, out of them all, not only among what I have, there was one that stood out for me.. The Connor's Tomahawk Replica.. Not the toyish retail version, but the press version which was never made available to the public. Made of high-quality latex and presented in a beautiful wooden box.. This was a very remarkable item. Not only is it visually stunning.. 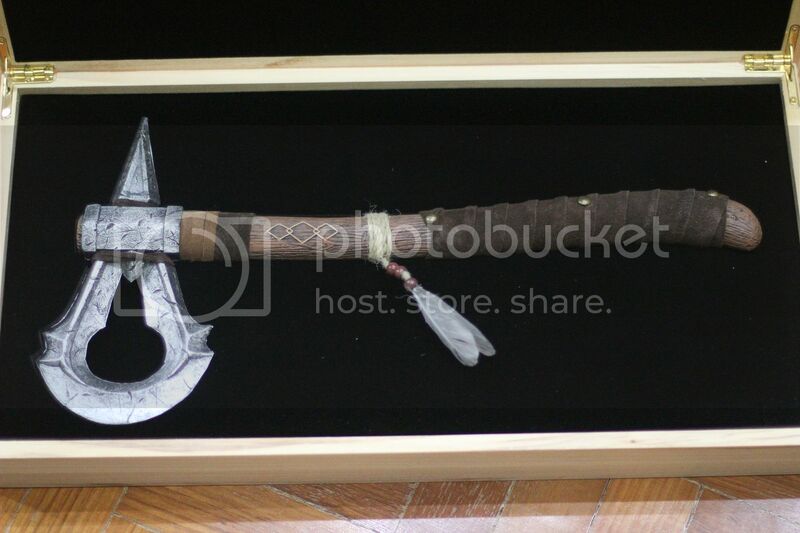 The whole experience about finding AC3 collectibles from around the world, getting a bunch of rare stuff together with this item, a very important weapon to Connor in the game, this being so rare.. Everything surrounding this Tomahawk just made it a special item to me. I didn't want to rate the top 5 in any order but this has to be the Numero Uno Collectible of 2012 for me. Not just in 2012, this one would have been one of the Top collectible in any year it's released in. So there you have it, my top 5.. What were yours? Love to hear your comments below. The ones that didn't make it..
From Mortal Kombat.. Never have there been Mortal Kombat statues before this, but since late 2011, Mortal Kombat statues have been hitting the market and my room.. The beautiful ladies of Mortal Kombat were gorgeous in their statue forms but never been much of a fan of them in the game itself. Ermac Premium Format from Syco Collectibles was epic but he lags behind a couple of other ninjas as my favourite. Scorpion from Pop Culture Shock was another epic piece but it came with a small broken piece which wasn't even in the box making me so pissed off with it. Just seems incomplete to me now. There were a couple more MK statues slated for released at the end of 2012 but delays pushed it back to 2013. Those would have given the ones above some competition so 2013 might see some of them making the list, but it's still too early to say.